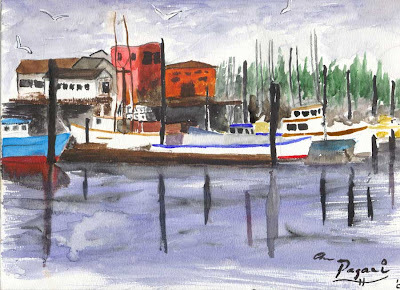 9x12 watercolor of Garibaldi Harbor in an abstract impressionist style like you might find with someone like Domenic DeStefano; I can paint photo-realistically but I can also take photographs! Painting a picture in an abstract style that you can still recognize is more fun. There may be posters available at The Roadside Oregon Artist Gallery. I'm reading: Garibald Harbor WatercolorTweet this!